Admission is free, there will be hors d'oeuvres for everyone, and as a special treat, the FIRST 30 people to RSVP for the event will also receive a free drink ticket! And since this is the season of giving, we are asking all our guests to bring an UNWRAPPED TOY, or a donation, as part of our GHBA Gives Back Christmas Toy Drive. In doing so, you can help us make this Christmas a happy one for families in our community who may be struggling this holiday season. 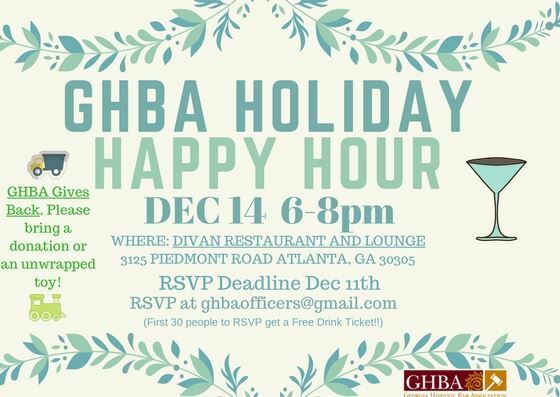 To RSVP, please go to GHBAOfficers@gmail.com, and include your name and the names of any guests coming with you. Remember, our first 30 RSVPs will be rewarded with a free drink ticket at the event. We look forward to seeing you all there!